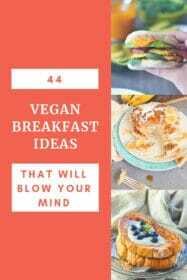 This fabulous gluten free vegan Bircher muesli recipe is the perfect way to start the day. 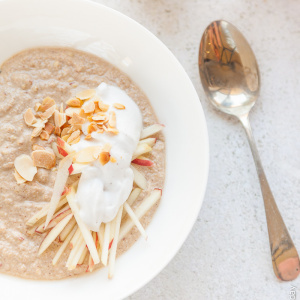 Top with apple matchsticks, coconut yoghurt and toasted nuts (or even toasted buckwheat to keep it nut free) to start your day in the best way possible. I’ve been trying to shake up my breakfast routine of late. I’ve been stuck in a rut, albeit a delicious rut, of avocado on toast or chickpea pancakes. 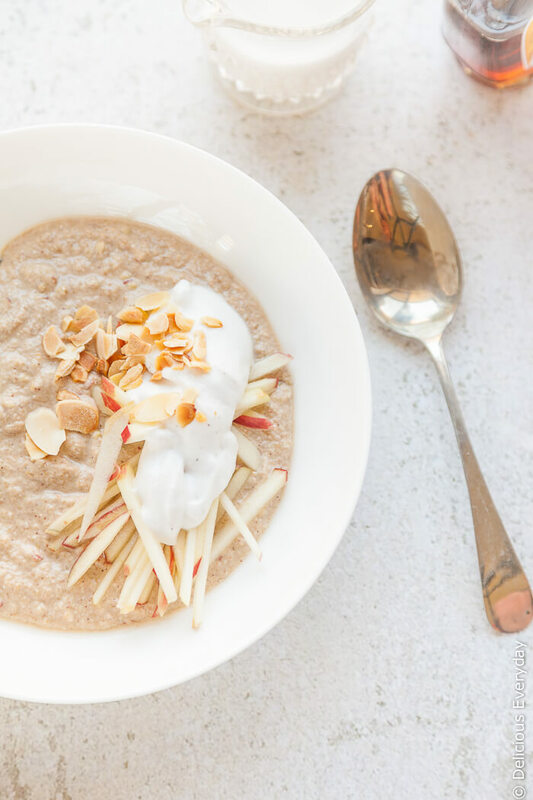 I’m not much of a sweet breakfast person, however, this fabulous Apple Crumble Buckwheat Bircher Muesli is a wonderful indulgent treat, sure to break you out of the deepest, darkest, most boring breakfast routine. Instead of the oats found in most bircher muesli I’ve used buckwheat. 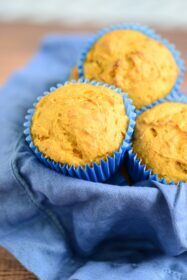 Buckwheat is one of my favourite ingredients, not only because it is delicious, but budget friendly too, and, despite its name, it is completely gluten free. 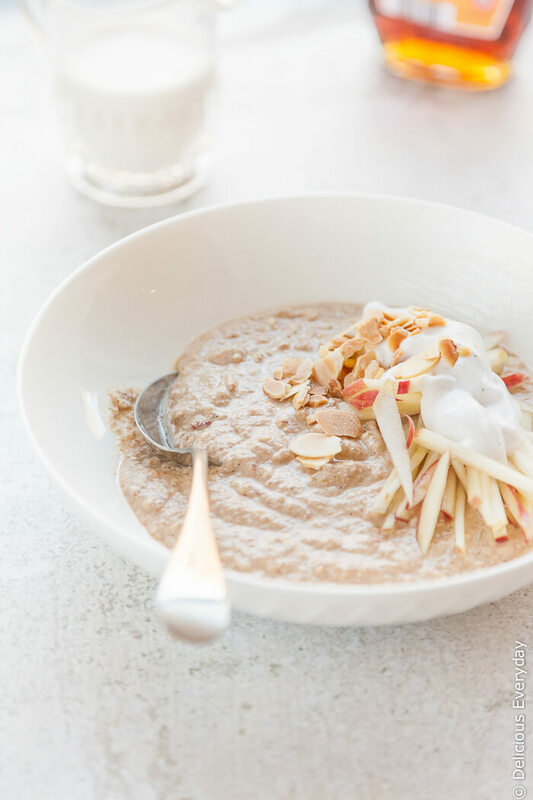 The buckwheat only needs to be soaked for an hour to become soft enough to blend into this fabulous creamy bircher muesli. Along with apple juice, a whole apple, cinnamon, and maple syrup, this muesli is absolutely divine, and one to break out on weekends when you are looking for something a little extra special. I’ve topped my buckwheat bircher muesli with vanilla bean coconut yoghurt (nudie do a great one), apple matchsticks and toasted flaked almonds, but feel free to add the toppings of your choice. Toasted buckwheat is great, for a nut-free crunch and stewed apples are another wonderful addition as well. 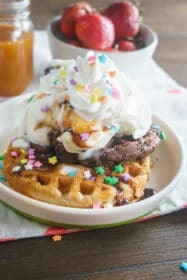 A wonderful gluten free breakfast treat. When the buckwheat is soft enough you should be able to squish the grains between your fingers. Drain into a fine mesh sieve and rinse under a tap. Place the sieve over a bowl and leave any excess water to drain while you prepare the remaining ingredients. 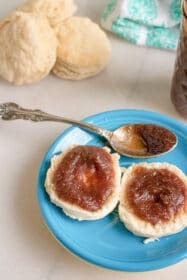 Place the chopped apple, apple juice, the cinnamon and 1 tbs of the maple syrup into a blender. Add the drained buckwheat and blend until smooth, adding more apple juice as needed to assist with the blending. Taste and add more maple syrup as needed. Divide the buckwheat bircher muesli between 2 bowls (it might stretch to 3 depending on how hungry people are) and top with your favourite garnishes.